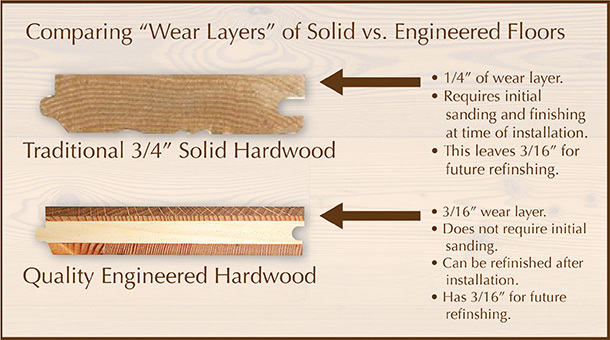 Reclaimed and Engineered Hardwood Flooring FAQs | Nor-Cal Floor Design, Inc. 1.) What is engineered flooring? It is a layered wood flooring product “engineered” to improve the stability of the plank. We engineer our homes, why not our floors? 2.) Is all engineered wood flooring the same? Some people think that engineered flooring is not as good as solid, 3/4 inch, wood flooring because they think that it’s cheaply made. As with most products, there is a varying level of quality, which typically coincides with the price. The engineered floors on the cheaper end are typically manufactured in China and are meant to appeal to and be affordable to a certain market of buyers. These cheaper engineered floors are typically 3/8 inch thick and have a paper thin wear layer that can not be refinished. The popular statement, “you get what you pay for” is very true in the wood flooring industry. On the opposite end of the spectrum you will find our engineered wood flooring. Our planks are the ideal alternative to a solid floor. Achieving the same look without the cupping and warping. Our engineered planks are comprised of a 3-layer construction making them more stable, with less cupping and warping than a solid floor. The top, wear layer, is 4-5mm thick. The center, core layer, is vertical grain spruce laid transversely to the top and bottom layer. This reduces shrinking and swelling by 80% compared to a solid plank. 3.) What are the main benefits of engineered flooring? Increased stability, minimizing cupping and warping of the planks. Engineered planks can be installed below grade, where solid can not. Installation over in floor radiant heat systems, where solid is not recommended. 4.) Can a Nor-Cal Floor Design engineered flooring product be refinished? The biggest misconception about engineered wood flooring is that it can not be sanded and refinished as can be done to a solid floor. A quality engineered wood flooring product, such as ours, can be sanded and refinished just as done with a solid floor. The wear layer determines the amount of sanding that can be done. An engineered floor can have the same thickness wear layer as a solid floor has. On a solid floor, the wear layer is the height above the tongue & groove. This similarity gives quality engineered flooring the same ability as with a solid floor to sand and refinish. In the illustration below you see solid having 1/4” and engineered having 3/16” wear layer. This is prior to installation. A solid floor gets sanded and finished at the time of installation, leaving the wear layer with a similar 3/16” for future sanding and refinishing. A engineered floor can be finished before or after installation and does not require a sanding at the time of initial finishing leaving the 3/16” for future sanding and refinishing. 5.) Can engineered flooring be used in both residential and commercial construction? Yes. Our planks are suitable for both residential and commercial over all substrates. It can be glued, nailed or floated installation to meet specific project requirements. 6.) Are Nor-Cal Floor Design products environmentally sound? At Nor-Cal Floor Design, creating a safe environment for our clients as well as employees is very important. Unfortunately, many floor finishes contain harmful petroleum- and chemical-based solvents that emit volatile organic compounds, or VOCs, which compromise your home’s indoor air quality (sometimes even after they’ve dried) and damage your health when inhaled. Whenever possible, we encourage the use of zero voc natural oil finishes. Some oils do not contain wax; they are based on vegetable oils and non-aromatic solvents. The oil penetrates into the surface of the wood, and as they cure, harden to form a protective surface that becomes part of the wood floor. Small scratches and indentations caused by normal wear and tear are less noticeable and can be spot repaired. To learn more about some of our certified green products, click here.